Contrast that with the production of Julius Caesar I directed in 2012 in which an Obama-like Caesar was stabbed by right-wing conservative conspirators. 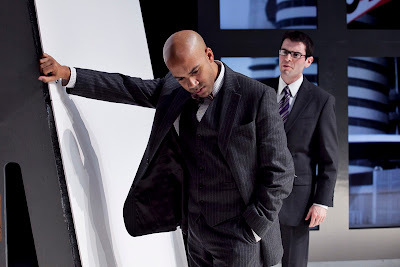 Starting in Minneapolis, the show -- co-produced by the Guthrie Theater and the Acting Company -- toured the country before a month-long run in New York. There was no public outrage, and Delta, which happened to be funding the Guthrie that season, did not pull their funding. Even though Oskar Eustis’s wonderful Trump / Caesar production was in many ways an inverse version of the production I directed, the president-as-Caesar conceit worked beautifully and both productions come to the same conclusion -- one that that should give comfort to Republicans, Democrats, and indeed all Americans: that no matter how righteous you think your cause is assassination as a way of changing a political regime has dire consequences and controlling history through violence is impossible. 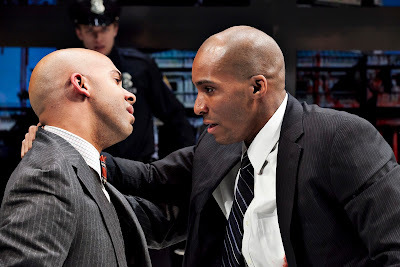 In our production both Caesar and Brutus were played by African-American actors. As Caesar, I cast the tall, charismatic, and confident Bjorn DuPaty. He conveyed an ease and a grace that made him an effective leader of the people. Will Sturdivant played Brutus and is, in my opinion, one of the best speakers of Shakespeare’s verse on the planet. His voice is a combination of Sir John Gielgud and James Earl Jones. My inspiration was drawn from any number of smart, serious African-American conservatives -- Clarence Thomas being but one example -- who at times can find themselves in a conflicted alliance with their fellow conservatives. 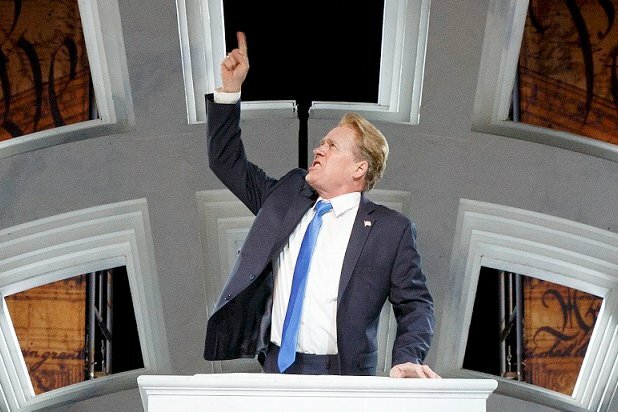 I think one key difference in the corporate response to the two productions is simply that most people who wrote about and talked about our production -- the one with an Obama-like Caesar -- actually saw the show, where it is clear that most of those outraged by The Public Theater’s Trumpian emperor either didn’t see the play or didn’t stay to the end. The Breitbart article that started the controversy is -- I kid you not -- a review by someone who talked to someone who saw the show. This second-order correspondent also thinks the play ends with the death of Caesar, as if they are killing the bad guy at the end of a superhero movie. In fact, the assassination takes place in the middle of the play, the rest of which deals with the terrible consequences of this action. Shakespeare built the outrage into the text. 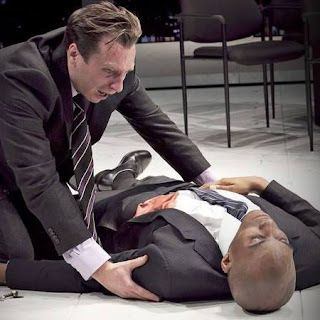 Mark Antony is so outraged -- for himself, and on our behalf -- that outrage suffuses the play’s entire second half. If you see a production, you get outraged with the play, not against it. Our Obama-inspired production also didn’t have any gestures that tipped our hand to say “this is definitely Obama.” We wanted to make sure audiences could make the Obama connection if they wanted to -- or could ignore the connections if they only wanted to live inside in the circumstances of Shakespeare’s play. In Eustis’s production, the Trump connections are more overt : Caesar wears an overly long red tie, Calpurnia speaks with a Slovenian accent (or “Slavic” if you are writing for Breitbart). There is also much more humor and satire in the Public Theater production. 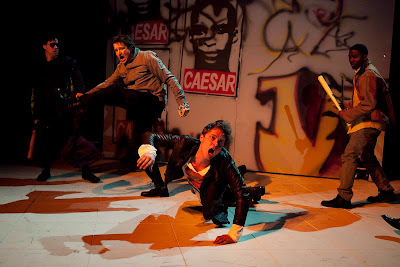 Caesar usually is not a very funny play, and I tip my hat to Oskar Eustis for finding so many genuinely funny moments. That may have bristled some people as well, but Eustis is hardly the first person to make fun of the president. In 2012, the producer of The Acting Company, was very concerned that this production was going to get us into trouble, and she really didn’t want us talking too much to the press about the concept. The reaction by Delta and Bank of America to the current production suggests that her fears then were well founded. I was content not to talk a lot to the press, because directors like the production itself, not interviews or reviews, to be the final word. So I was happy for the audience enter the world of our production without pre-knowledge of the interpretation -- experiencing it for themselves in the moment. In the 2008 presidential campaign, Vice Presidential candidate Sarah Palin said that people criticizing her were trampling her First Amendment rights. This was a low point in people’s understanding of our Constitution, and really hasn’t been properly corrected (the First Amendment, of course, protects people’s ability to speak freely about their governor – it doesn’t allow the governor to say things without being criticized). Was it Bill Rauch in the Elizabethan Theater with the candlestick? Was it Lue Douthit in the OSF dramaturgy office with the rope? Or was it Campo Santo’s Sean San Jose in Library with his brand new “translation” (gasp) of Shakespeare’s Coriolanus? This past week has been a bad one for my friends at The Oregon Shakespeare Festival who have just embarked on their Play On translation program in which 36 playwrights will translate (and not adapt) all 39 plays attributed to Shakespeare that we currently have (we still can’t find Cardenio – it is still lost or at the very least misplaced) with the help of a number of dramaturges including me for Sean’s Coriolanus. The press release is here and the project’s leader Lue Douthit’s answers to questions are here. They’ve been getting a lot of criticism for the project. It has also been a hard week for the people who think that this project is going to cause great harm to the Shakespeare canon or at the very least be a monstrous waste of time and money. For me, it has been one of the best weeks of my life. Why? Because for one week, Facebook and the internet has been abuzz with people passionately arguing about two of the things I care about most: Shakespeare and Translation. I am savoring this moment and reading everything, knowing that the honeymoon period will be over soon and people will be going back to talking about what I care nothing about: sports. So while we are in this sweet spot between OSF’s announcement and baseball playoffs heating up, I’m going to make hay while the sun doth shine and weigh in with my perspective. I have an interesting take on all this because I am both a Shakespeare-lover and a translator and I spent a year in Europe in 1997 on a Fox Foundation grant studying productions of Shakespeare in translation in France, Germany, and Italy and since have seen dozens more now including many productions in Poland. I’ve directed Shakespeare plays at The Oregon Shakespeare Festival, The Public Theater, The Guthrie Theater, and The Cutting Ball Theater where I am the artistic director (currently on sabbatical which is why I have time to write this!). I’ve also translated plays from French, German, Italian, and Swedish and am deeply interested in the issues of translation. Because I’ve been engaged with the Shakespeare world and the translation world, I’m in the interesting position of knowing most of the people who have been arguing for and against this project and I’m able to see the logic in the arguments on both sides. So if you will indulge me, I’d like to do a deep dive into what this is all about and where I come down in all this. First some background: my first encounters with Shakespeare were neither easy nor love at first sight. Like most people, I starting reading Shakespeare in junior high and high school in English class and found it pretty hard. Fortunately I lived near the Guthrie Theater and saw excellent productions of Richard III, A Midsummer Night’s Dream, and Hamlet. I also played Orsino in my high school’s production of Twelfth Night. Still I didn’t really get, “what was so great about Shakespeare” but trusted that older, wiser people knew better than I did and that I should keep studying. I took four semesters of Shakespeare classes in college as well as a year and a half of Shakespeare classes in drama school. That didn’t prevent my first two productions of Shakespeare from being utter failures. When I was nineteen, the first review of my direction of Shakespeare was the Trentonian’s pronouncement “Twelfth Night is Inexcusable!” Harsh huh? Then in graduate school, I studied Macbeth until I was blue in the face. Intimidated by all the experts around me, I turned in a very reverent and very boring production (despite great work by the actors). Master design teacher Ming Cho Lee said (in his cutting wisdom) to my directing teacher (the wonderful David Chambers), “That Rob Melrose, he knows everything there is to know about Macbeth! The only thing he doesn’t know is what he wants to do with Macbeth.” So far, so bad. I still had a long way to go. Shakespeare is not easy, his plays are like big symphonies and there is a lot going on in them. I do not blame anyone for feeling intimidated by these big, thorny plays. My last year in graduate school changed my life. Knowing of my dogged perseverance with Shakespeare and my love of European theater, my directing professor David Chambers suggested I read a book called Foreign Shakespeare by Dennis Kennedy (had it been written today, it would probably have been called Global Shakespeare). In it, Kennedy argued that productions of Shakespeare translated into languages other than English are able to take more production risks than productions in English both because in a contemporary French, German, or Italian translation every word is understood by the audience and since the language is contemporary and doesn’t have strong associations with a previous era. In French, German, and Italian, the plays are still richly poetic but it feels like poetry written today, not something from the past. These bold productions of Shakespeare in translation really intrigued me. Then I also took Paul Schmidt’s translation class. I was working on my translation of Pelléas and Mélisande and Paul was working on his translation of Phèdre for the Wooster Group as well as a translation of Shakespeare’s Timon of Athens into contemporary English for Erin Mee’s production at HERE. This was in 1996 and definitely not the first contemporary English translation of Shakespeare, just to show that OSF isn’t the first theater to do this, they are just the first to do it on such a big scale. Paul had a very interesting set of rules for himself. They were that he would replace any word that no longer had any meaning in contemporary English or that had shifted meaning substantially. He would replace the word with another word that both scanned and existed during Shakespeare’s lifetime. What resulted was a beautiful, poetic, very readable and playable version of a play that most people don’t know or experience. He was making a good case for Shakespeare’s Timon of Athens which really wasn’t being done at all back then. Fueled by both of these experiences, I applied for a Fox Foundation Fellowship (with great encouragement and guidance from David Chambers) to be in Europe for a year observing productions of Shakespeare in translation. I received the grant and my whole theatrical world was opened wide over the course of a year. Kennedy’s book was absolutely correct, I saw productions of Shakespeare unlike any I had seen before: deconstructed productions in France by Danielle Mesguich, Brechtian productions in Germany by Dieter Dorn, commedia dell’arte inspired productions by Glauco Mauri, kabuki productions, post-modern productions, etc. It was all really exciting. I was determined that when I came back to the U.S., I would do my own productions of Shakespeare with this bold spirit. When I returned to the U.S., I moved to San Francisco and founded The Cutting Ball Theater with Paige Rogers. Our first foray into Shakespeare was being a part of Trevor Allen and Karen McKevitt’s Shakespeare Marathon in 2000, in which theater companies from the Bay Area did staged readings of all Shakespeare’s plays of the course of a couple of weeks. Cutting Ball got Timon of Athens in the Easter Morning slot (believe it or not people actually came). I wanted to do Paul’s translation of Timon but Karen and Trevor wanted the festival to be strictly Shakespeare. At first I was disappointed, but as I worked on the play, I found that I loved Shakespeare’s original and that Paul’s translation had helped me find a way into the play but that now I was enjoying having an experience of Shakespeare’s language. It reminded me of something David Chambers had told us in our Shakespeare class. For him, the tricky grammar and the rich, strange language were the actors’ and director’s challenges and for him that was the point of doing Shakespeare. It was then I realized that I wanted to have the best of both worlds. I wanted bold risky productions with clear, invested, beautifully spoken Shakespeare. This led to a series of productions at Cutting Ball: a surreal Macbeth centered on the death of Lady Macbeth’s baby, a Richard Foreman-inspired As You Like It in the wilds of California, a meta-theatrical, gender-bending Taming of the Shrew, and a dream-like Tempest set in a psychiatrist’s office at the bottom of a swimming pool. These led to directing productions of Troilus and Cressida at OSF set during the 2003 U.S. invasion of Iraq, a Julius Caesar inspired by the Obama Administration at the Guthrie with The Acting Company, and a highly theatrical Pericles that drew from all over the Mediterranean and the Middle East at the Public Theater. More on all these productions can be found on my website here. So in many ways I seriously considered doing translations of Shakespeare in my own career and rejected it (or at least chose not to go down that path for the time being). I have spent lots of time with former RSC text and voice directors Andrew Wade and Cecily Berry as a part of Theater for a New Audience’s Actors and Directors Program and have also worked with Andrew at The Guthrie, Cutting Ball, The Acting Company, and The Public. Andrew and Cecily have developed countless ways of leading a company to embrace Elizabethan verse in order to make the most difficult passages in Shakespeare felt by an audience. A tiny, simple example that Andrew loves is representative. He asks his actors to say, “What a pother,” and then asks them what they think “pother” means. By saying it and hearing it and with this little bit of context (“what a…”), a lot of the meaning is there even though we’ve never encountered the word before and don’t have a dictionary definition in front of us. As Professor James Shapiro points out, Shakespeare was coining new words in his plays all the time and perhaps only he understood every single word of his play. It is up to the director, designers, and actors to create the context that allows us to learn the new and unfamiliar words as they come. I had the wonderful pleasure of working with Professor Shapiro (Jim) on my production of Pericles at The Public Theater. I agree and sympathize with all he says in his New York Times Op-Ed, “Shakespeare in Modern English,” save for the opinion that the project is a waste of time and money. I don’t believe that, and more on that anon. I do, however, feel great kinship with his passion for the original language and for the challenges and rewards it affords directors, scholars, actors, and dramaturges who are willing to put in the time to understand the text and who delight in sharing that understanding with an audience. Our Pericles was similar to the Much Ado Jim describes. They were both part of the The Public Theater’s Mobile Shakespeare Unit. Our Pericles was 90 minutes, used the original language albeit significantly cut, and was extremely well received at the community centers, homeless shelters, and prisons it toured as well as its run at the Public. There was very little in the way of set and costumes in many ways the production was the language. The fact that it is possible for contemporary audiences to enjoy the plays in the original language makes it understandable many people (the people in Jim’s camp) don’t want to give in and have Shakespeare adapted to fit perceived current tastes. There is a very long history of producers adapting the plays in ways that seem embarrassing to us now: giving Lear a happy ending, bowlerdizing the plays (making them family-friendly with no bawdy parts), and rearranging the scenes to accommodate the clunky scenery of proscenium theater so that instead of jumping from location to location – all the scenes in one location are put into act one and all the scenes in the next location are in act two, etc. While these might have seemed like experiments to please current audiences, they were actually so popular that they were played for decades so that you couldn’t see a production of the plays the way Shakespeare wrote them. I don’t think anyone wants to go back to those days (especially my friends at OSF), and while I’m hoping for this project’s success, I don’t think it is possible that it will be so successful that we ever see a day when “translated” productions outnumber original language productions. I don’t think that is what anyone at OSF would wish for either. I do, however, see a wonderful opportunity here. Just as I wanted the best of both worlds for my productions of Shakespeare: bold direction and original language, I think the American Theater can stand to have original language and translated productions. I’d love to see what that does to productions and if, like I’ve experienced in Europe, if it leads to more freedom in direction and production. As a director of many original language productions, I think it is important to come clean about what an audience is really seeing when it sees an original language production. No one since the Elizabethans and Jacobeans has seen a production of the plays Shakespeare wrote them. First Shakespeare did not oversee the publication of his plays so there are a number of different versions of most of them and directors have to choose what versions to use and what editors to trust. Even an uncut production by an absolute purist is going to have to make artistic choices. Secondly, most productions done today are cut and words are changed here or there to accommodate the cut or to make a really tricky passage more clear. On some level, you’ve been watching translated Shakespeare for years but just haven’t known it. The guidelines the playwrights have been given for OSF’s Play On project are to have a very light touch. These are translations and not adaptations and many of Shakespeare’s lines are going to stay as they are – quite possibly 90%, the estimated percentage of words that are still completely clear to a contemporary audience. This project can be seen as having playwrights doing with consistency and rigor throughout the entire play what a director will often do on the fly in the middle of a rehearsal with troublesome sections of the text here and there. An even deeper issue is the issue of translation itself. I’ve read Crime and Punishment, but since I don’t speak Russian I haven’t actually read one word that Dostoyevsky wrote or would even recognize, and yet I feel like I’ve read it. When I tell people I’ve read Crime and Punishment, I don’t make a point to say, “but only in translation.” When we read a translation, especially a good one, it feels like we have access to the original. We feel this way with Madame Bovary, The Iliad, and the Bible even though we may not be able to read a word in the original language. How is it that we feel we have read Crime and Punishment without reading a word of Russian but we feel like something wrong is happening when ten to twenty percent of Shakespeare is updated? I think there are few things more rewarding than reading a work in its original language. It is for this reason that I’ve studied (but in no way mastered) eight different languages. There are lots of works I want to read in the original. It is something I value highly. At the same time, people have rich experiences of works in translation all the time. Did you know that the most produced playwright in France, Germany, and Italy is consistently Shakespeare? It’s not Racine, Goethe, and Goldoni. We often talk about Goethe as “the German Shakespeare,” but the German Shakespeare is really Shakespeare. Each country has made Shakespeare its own. German’s love to say, “Hamlet is better in the original German.” I recently went to Abu Dhabi for NYUAD’s Global Shakespeare. People came from England, India, Egypt, Chile, Yemen, Bahrain, the UAE, and the US to talk about what Shakespeare means to each of their countries. It is amazing and exciting to hear about how Shakespeare changes from culture to culture. Each one interprets Shakespeare in its own way. In India, there are numerous Bollywood films of Shakespeare’s plays, sometimes stripped of everything we associate with Shakespeare: the language and the setting. The good news is that the originals still exist are totally unharmed by other artists and cultures building on Shakespeare’s work. It is not unlike Shakespeare himself building on his sources Plutarch and Boccaccio (through Chaucer) to write Julius Caesar and Troilus and Cressida. Dante is one of my favorite writers. I’ve studied Italian so that I can read him in the original and it is extremely rewarding. At the same time, I have a bookshelf full of English translations of The Divine Comedy: beautifully reverent ones by Robert and Jean Hollander and by Robert M. Durling, very contemporary versions by poets Robert Pinsky and by Mary Jo Bang, and then an absolutely crazy, irreverent and delightful one by Sandow Birk and Marcus Sanders complete with drawings of California strip malls from hell. In the Birk and Sanders version, there are none of the endless notes that usually accompany an edition of The Divine Comedy. They’ve really done their best to update the references themselves so that a reader doesn’t need to constantly flip to the back for the notes in order to understand what is going on. Is it Dante? Sure! It is a version of Dante and the experience of reading straight through without flipping back and forth is really pleasurable and offers something the other versions don’t. Each translation has something new to offer. English speakers who can’t read Italian are missing out on a lot by not being able to read Dante in the original, but at the same time Italians who can’t read English are missing out on a lot by not being able to read all these wonderful and different translations of Dante. By having about five or six major English translations of Dante each generation, we are keeping him alive and continuing to find new things in his work. This is what happens in non-English speaking countries with Shakespeare every generation. Each translation finds a new Shakespeare and this is something we as English speakers have not been able to experience…until now! I love translators and playwrights almost as much as I love Shakespeare scholars. Some translations are going to be better than others, but each playwright is going to have to wrestle with Shakespeare and that to me is going to be really exciting. I recently got in a Facebook debate with my playwright friend Christine Evans. Christine proposed that we have a moratorium on Shakespeare for five years and to do new plays by women in their place. I said it was a good idea but that she was picking on the wrong guy. I proposed that we keep doing Shakespeare and we stop doing endless regional repeats of the play that was a hit in New York the season before and that there is how we could find space for lots of new innovative plays. I’ve always contended that playwrights benefit from seeing excellent productions of great classic plays (especially Shakespeare). While I still believe this is true, I realize that it only the playwright who is out of an opportunity when we choose to do Shakespeare. The actors, designers, and director still have a job. I can see how they feel left out of the party. What I love about this is that Lue Douthit at OSF has chosen some really wonderful playwrights to work on these translations. I think they are going to bring their own artistic sensibilities to the project but even more importantly, they are going to get what until now only the actors, directors, and designers have gotten: the chance to work deeply on a Shakespeare play. James Shapiro wishes the money were being spent on commissioning the next Hamilton. I would argue that there are tons of theaters and foundations trying to commission the next Hamilton. I think this experience will help playwrights think bigger, write bolder plays, and take better advantage of those commissions when they come. After over 25 years of working on Shakespeare, his work comes to me much more easily than it did when I was in high school. At the same time, it is important not to forget how daunting those first steps can be for some people, not all. I was reminded of this when I was preparing for my production of Troilus and Cressida at OSF. I thought that it would be a good idea if I read Shakespeare’s source for the play, Chaucer’s Troilus and Creiseyde. It was really tough. I have Chaucerian friends who talk about Chaucer the same way Andrew Wade, James Shapiro, and I talk about Shakespeare. They think Chaucer is the greatest author who ever lived and they think that one can read him in the original with no problems. Well I couldn’t. I bought modern translations, courses on tape about Chaucer, books on how to read Chaucer. Eventually I made it through the original but I needed lots of help and it wasn’t easy. Of course, today most people read Chaucer in a modern version unless they are at a University and I can see why. It is tough to do on one’s own. This might be what Shakespeareans fear: that one day the general public will only read Shakespeare in translation unless they are in a college class. It could happen, but I think Shakespeare is such a deep part of our culture in a way that Chaucer isn’t (sorry Geoffrey), that it will be a long time from now. Still, I have no judgment for people who feel they need their No Fear Shakespeare or their Cliff’s Notes to help them through the original. While I don’t need those now, I definitely had times in the beginning where I did. And I don’t judge the many people who are going to benefit from reading and hearing these plays in these new translation and having access to them in a way they are not previously had. Linguistics Professor John H. McWhorter wrote a great piece in the Wall Street Journalabout the project. McWhorter is a wonderful teacher and has a whole series of audio courses through the Teaching Company. I’m a huge fan and have listened to all of them. He has a very fluid attitude towards language (descriptive rather than prescriptive) and constantly reminds us that language is always changing. To get a sense of who he is, he tells a story of a woman who told him that she broke off her wedding plans with her fiancé because he kept making the same grammatical mistake again and again and she just couldn’t live with that. McWhorter thought it was a sad reason to end a potential marriage and to top it off the mistake the fiancé was making (I think it was a double negative) was actually the correct upper class way of talking just 50 years ago. Language had shifted since then, it wasn’t wrong, it was just not how the ruling class was speaking anymore. In his WSJ article, he points out that for the most part we can’t really understand much of the advice Polonius gives his son anymore. Polonius is a pedant, so that can make sense in a production, but even a relatively famous speech of Macbeth’s has challenges because of the way the language has changed. The original language is beautiful, but wouldn’t it be nice to have the experience of hearing a Shakespeare play and understanding every word for a change? Not forever, but just every once in a while. In the same way that I enjoy my California strip mall version of Dante, in the end it is not as rewarding as reading it in the original Italian, nor even as rewarding as reading a faithful translation with all the necessary notes, but it offers its own relaxing and pleasurable experience that gets you ready for the trickier stuff. I am not first generation Shakespeare. My great-grandmother read him in Bengali between bouts of giving birth to her thirteen children. I also learnt recently, that she would, despite relentless poverty and no education, save up her money to pay local actors to come to her house and perform for her and all her children in the evenings. When she made the long walk to Calcutta on foot during partition, I wonder whether she took her dog-eared copy in Bengali with her or if she was forced to leave it behind. Our borders are bleeding all over the world. And who knows how many lives are being changed by the words people are carrying in their pockets; they just may be words in translation. I will, when I begin my translation of Merry Wives of Windsor, be writing it for my great-grandmother, and in tribute to people, living and dead, who have long sought solace in Shakespeare’s language. Let’s not forget the primary function of translation is to create access. Not only to the language but to an imaginative space, something in our culture that’s all too often under threat. Shakespeare, for better or worse, gives us permission to imagine and access to it just may be potent enough to change a life. The project is just underway, but already Dipika’s post makes me think that it is already worthwhile: both the project itself and the diversity of voices OSF and Lue have put at the heart of this project. This beautiful testament to Shakespeare’s power and reach wouldn’t have been written if the translators and dramaturges were all white men (like me) and if this project had happened fifty years ago, that is most likely what it would have been. I am extremely excited to read Dipika’s translation of The Merry Wives of Windsor and the many other translations by extremely talented playwrights from a wide variety of perspectives and backgrounds. I am a huge fan of the Public Theater’s Mobile Shakespeare Unit James Shapiro so lovingly describes and the access it provides. I also love this project and think the access and perspective it will provide will prove to be invaluable.